Maul the Bear is introduced to Avalon later in the year, taking up residence directly west of the Avalon Fighting Pen. Maul assists humans in their quest to claim their elven heritage, and has a strong affinity for fishsteaks. The Britannia Search & Rescue runes for Felucca treasure sites have been made public, allowing for treasure hunters to satiate their desire to dig up hidden chests all over the facet. For those unfamiliar with this building: It is owned by Nobody and is located just north of Trinsic in the swamps of Felucca. Avalon resident and oddly named bowyer, Miss Calculation, now offers archery equipment that has her name emblazoned on each piece. You can usually find these in a crate at the 'Best Shot in the Realm' competition or by asking her in person. Several Avalonians attended the TAA/tDw 'Meet & Greet' event at the end of October, which was prematurely interrupted with news of a invasion of Moonglow in Trammel by hostile forces. Shard brought his boat to bear on the forces at the Moonglow Dock while several other Avalonians fought back the forces which Judge Julius Dryden accidentely unleashed on the city while conducting his odd experiments. Friends of Avalon, the Golden Brew Tavern, moved their operations from the mountains near Covetous to the entrance to the bridge just south of Luna in the broken realm of Malas. The tavern is owned by Joshua Rowan of the Golden Knights. Avalon resident Arion oversaw the massive undertaking of building the West & East Gate Guard towers at the forefront of the Avalon peninsula. They are hard to miss as there is a Avalonian guard standing out front. Kirby the Stablemaster (Luther's replacement) at the Avalon Town Hall was mysteriously recruited by the wandering brigands who frequent the area. We hired Herbert the Stablemaster to replace him although he quickly made off with the gypsies who also frequent the area. Dionne the Stablemaster is our newest hiring, and we hope she will be around longer than the others. The Dark Tower moved to Fire Island in Felucca, although a recent expedition in December to find the tower found naught but crumbled ruins amidst the jungle. 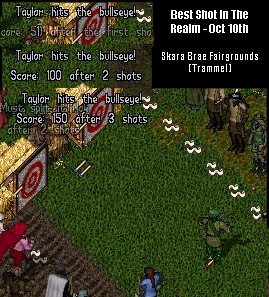 With several pulls of his bow, Taylor finally clenches not one... but two 'Best Shot in the Realm' archery competitions at the Skara Brae fairgrounds! After these epic accomplishments in April and June, Taylor will try his hand at the BSR 'Tournament of Champions' held on December 18th at the Skara Brae Fairgrounds in Trammel. Congratulations Taylor!!! New advancements in wood collecting allow for the discovery of the precious wood 'Frostwood' in Avalon. A sawmill is quickly built in order to process this hard to cut material. On a sad note, Klatuu's two-story wood and plaster dwelling was swept away by the unforgiving sea, earlier last month in November. Klatuu had one of the first homes on the peninsula and had been living in the area for about eight years. After a year of giving birth to several healthy purple llamas, Arion submits a poem entitled 'Ode to a Purple Llama' to playerpoems.com in November under his penname 'Felix the Green'. The poem is a uber-hit and is published in-game (now located at the Avalon Guard Tower). The Gentlemen of Fortune, a guild of pirates lead by Chango Pelon, establish their headquarters just east of Avalon, past the Ice Dungeon. From here, they adeptly pillaged everything on the Sosarian seas but mysteriously faded away over the months. 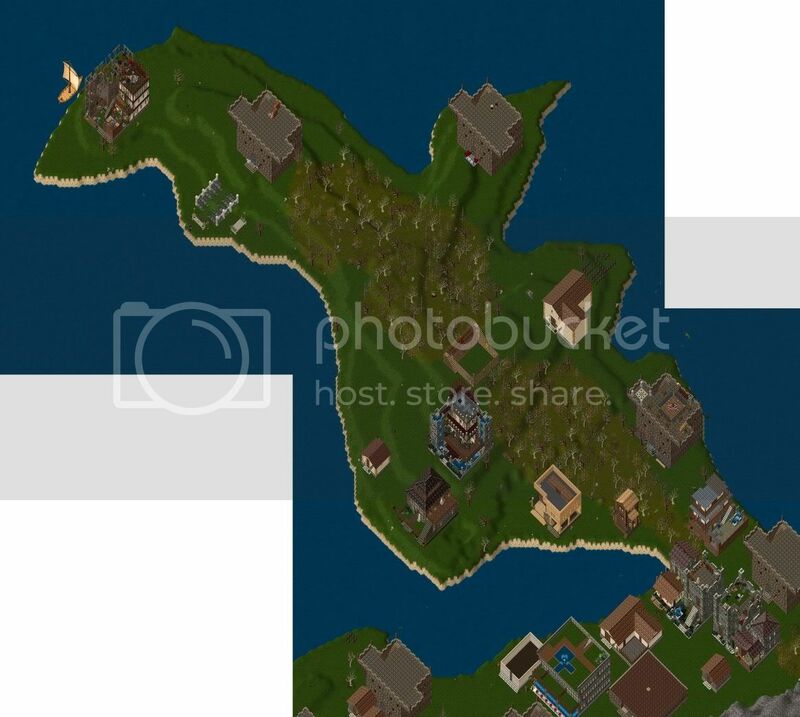 Longtime friends of Avalon, the Lumarians build a boat house at the TAA/tDw Marble Island Naval Base in Trammel, giving those remaining friends a place to go and reflect on Lumarian culture, or use one of the public ferryboats scattered across Trammel. A tavern and cross-purpose guard station has been built just south of the Rune Library along the coast in Avalon. Disdain just moved into the area and is currently fixing up the new structure. Several members of the horn-tooting, shard-touring 'Empire of the Fallen Lords' (EFL) came across from the shard of Pacific in order to help guard one of their treasure troves located just south of Avalon. A large battleground formed over the course of a few days, and we were there to help secure some of the Pacific funded treasure to line the wall of our own Baja vaults. There you have it folks, the year in Review. If you have any additional information to add, please let me know over on the Avalon Forum and I'll put it in. Taylor Places 4th in BSR Archery Tournament! Nearing the end of its third season, the "Best Shot in the Realm" Archery Tournament returned in full force this weekend! The Society of Archers (S|A) Baja Chapter, hosts of the event, announced that there will be a new BSR Tournament every three weeks until the final seats in the season-ending "BSR Tournament of Champions" are filled. This unique event will pit the previous 12 monthly winners head-to-head to determine the land's finest shot, and to compete for a prize never before seen in such an event! With only four seats remaining, and with one up for grabs this past weekend, dozens of the land's finest marksmen gathered at the Skara Brae Fairegrounds on Sunday to test their mettle against the realm's best. As one familiar face after another arrived at the Fairegrounds, it became clear that the coveted spot in the season-ending finale would be hard earned this day. Many previous competitors, several encrusted in BSR Lore, were at the event, mixing in with a few new faces and a large crowd gathered to observe. You could just tell that something more than the 100,000gp purse motivated these Archers. The excitement could be felt in the air as the event kicked off! The first round, yet again, proved to be nothing more than a warm-up, as the Archers gauged the wind and made their adjustments for future rounds. With everyone passing the initial round, the bar score was raised, and the games began! One by one the Archers fell out, as the score continued to rise, and the competition intensified. The level of talent at this month's event was jaw dropping, as after several full rounds nearly a dozen Archers still stood. Taking into account the sheer talent gathered, the Archers were asked to display nothing short of perfection: three arrows all placed in the dead center of the target. What used to be a deciding and insurmountable round in tournaments past, amazingly proved to be nothing more than another tune-up for this gang... as six Archers stuck all their shots in the bullseye, to a roaring crowd's approval! Realizing that this particular group of Archers might fire bullseyes well into the night if given the chance, the remaining competitors were paired head-to-head, one Archer to continue, one who's day would be done. Ruffus Cahn and Atheina started out the new style of round, and both posted excellent scores. But this was to be Ruffus's day, and he managed to squeak out a close round, splitting his final arrow clean in half, causing a roar that could be heard back at the Skara docks. Hearing their name called, Taylor and Lezander D'flaye, two experienced competitors in the BSR event, calmly took their marks. With a bow of mutual respect the two Archers let fly... Thhwack! Both arrows stuck neatly out of the bullseye. With a nod of approval, the Archers let fly again. And yet again, they matched jaw-dropping bullseyes. After five shots each, these two remarkable Archers were dead even. The noise was deafening as it was announced that they would continue shooting until we had a winner. Taylor quieted the crowd and then let fly another arrow, and yet again it struck gold, burying itself inside the now-crowded bullseye. Many in the crowd thought that shot would be it, but not Lezander. Lezander D'flaye stared down his butte and choose his shot. The arrow tore through the air, and buried itself in the bullseye, splitting the shaft of a previous shot clean in two. A brief moment of disbelief passed over the crowd, before it roared back up, realizing Lezander had done the unthinkable, Lezander had won the pairing! With near flawless shooting still not being enough this day, Taylor could do nothing but tip his hat to Lezander... and the event continued! The final group paired two Archers of S|A against eachother, Caelan and Daphne. Both were experienced competitors in the event, and both had been here before. Yet again the crowd was thrilled, as these excellent Archers matched eachother shot for shot. Once again the final arrow would decide the winner of the pairing, as Daphne's shot just missed the mark, giving Caelan a seat in the finals. The Fairegrounds buzzed with excitement, the crowd was exhausted from the cheering, and we had not yet found our winner! Shooting for score in the final round, Ruffus, Lezander and Caelan went right back at it. Astronomical rounds were posted by all three contestants, and everyone in attendance could feel that this crowd gathered was something truly special. But this was to be Ruffus Cahn's day, as he time and time again delivered in the clutch, and delivered when it was needed. Ruffus Cahn was awarded the title of "Best Shot in the Realm", and given the hard-earned 100,000gp purse. As mentioned before, Ruffus now also holds a seat in the year-ending "BSR Tournament of Champions", and will be represented in the finale, which will truly determine Baja's finest shot. The S|A Baja Chapter would like to congratulate Ruffus on his remarkable victory! His shooting on Sunday was truly second to none. At the Community Day, Lady Malynn got to meet a very nice person who is one of the newer members of the UO development team. Her name is Jennifer Lane (Niobe). Niobe has been working exclusively on the Samurai Empire expansion. Lady Malynn: What is your role in the expansion team? Niobe: I am a Designer. I’ve been working on the Samurai Empire since the UO development team moved to California in April. So, I’ve been on this project about 6 months. I’ve done a lot of work with the new creatures in Samurai Empire. I worked on such things as creature tables and the new house objects. I had a lot of input into the new content for Samurai Empire. I got to work closely with Oaks. That was a great opportunity. I really admire him. Lady Malynn: What has been particularly challenging for you on this project? Niobe: I worked on Earth and Beyond before joining the UO development team. But, I’ve played Ultima Online since it came out. I’m a long-time UO player. Working on UO involves a different set of tools and different people. But, it’s been a good experience. It’s nice to get back to a fantasy type game. It’s great seeing it all come together and work. Niobe: Oh yes! I did a lot of research into the Japanese lore. We didn’t want to offend anyone in the Asian culture when we made Samurai Empire. Japanese lore and the feudal Japanese stories behind the culture are fascinating. We chose many of the Samurai Empire creatures based on that lore. The depth of the stories behind some of the creatures is amazing. Did you know that there are many different types of dragons? Even the number of toes on a dragon has meaning. Did you know some dragons have wings and some do not? Only the most powerful and ancient of the dragons in Japanese lore have wings. Most Japanese dragons do not fly; our Samurai Empire dragons do not fly. Lady Malynn: If you were going to create a new Samurai Empire character, would it be a ninja or samurai? Why? Niobe: I think people will pick the ninja initially because it’s cool. But, I think I would try the Samurai first. After people try Samurai Empire for a while, I think they will appreciate the abilities of the samurai. Lady Malynn: What is your favorite new feature in Samurai Empire and why? I like that chefs are getting something to do. And I like the new items. I am really excited about all the new craftables in Samurai Empire. Niobe previously worked on the Community Team for EA's Earth & Beyond and then became a E&B developer until her job on the SE expansion team. 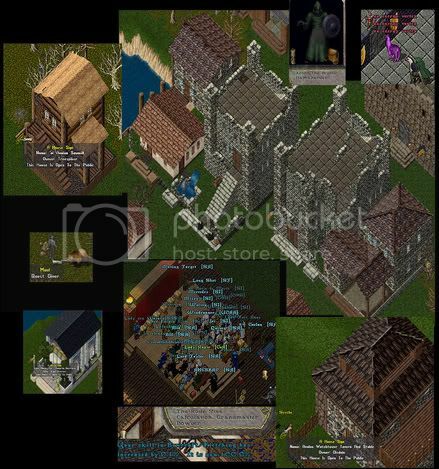 Exactly three years ago today, on Oct 1st of 2001, the Freeborn Press Newspaper shut down its press operations to the general public of the Baja Shard of Ultima Online. Today, three years later I am proud to announce a limited re-opening of the Freeborn Press, which will primarily cover news posted to the City of Avalon pages, and the occasional piece of archivable Lumarian news that could potentially cross my desk. Thanks go out to ‘Nobody’ for providing the communication crystals to get us up and going once more. This is a test of the Freeborn Press News Crystals. Bearing no interruptions, our paper will resume operations in a limited fashion tomorrow, exactly three years after its inkwells ran dry. The Freeborn Press archives for the months of November 2000 through January 2001 have been imported into the new publishing tool. This concludes the importing of the Freeborn Press articles, as this was the last set required to be imported. The Freeborn Press archives for the month of February 2001 have been imported into the new publishing tool. The Freeborn Press archives for the months of March through June 2001 have been imported into the new publishing tool. The BS&R news page is once again functioning. The old NewsPro archives has been adapted and important into the new Movable Type publishing system. The Freeborn Press archives for the months of July & August 2001 have been imported into the new publishing tool. The Freeborn Press archives have begun being imported into the new publishing tool. The archives for September 2001 are the first to be imported.